Construction underway at the old KFC Site on Penn Ave SE. 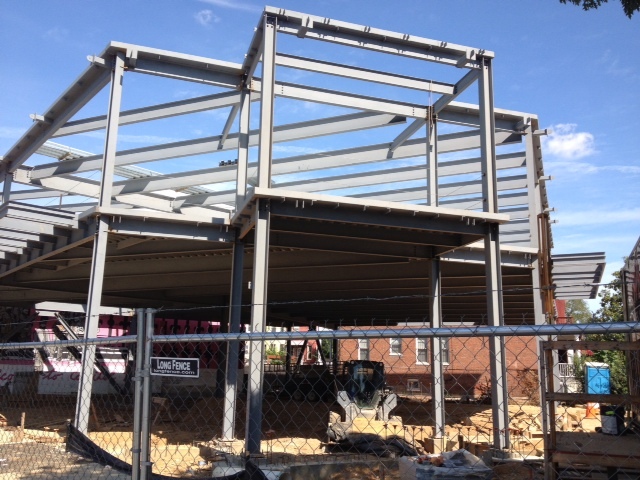 Construction is underway on the new two-story retail building at 1442 Pennsylvania Avenue SE, the old KFC site. At last week’s ANC 6B Planning and Zoning Committee meeting, Paul Millstein of Douglas Development, said that they expect construction to be complete by December. The company has been contacted by potential tenants but does not have any leases signed as of yet. A liquor license for District Taco (656 Pennsylvania Avenue SE), a fast food exception for Southeast Market (1500 Independence Ave SE), comments on proposed alternatives for the re-construction of Virginia Avenue Rail Tunnel and proposed testimony on Reservation 13 for an upcoming DC Council hearing are among the agenda (pdf) items for tomorrow’s (Tues., Sept. 10) ANC 6B September meeting. The meeting begins at 7:00 pm at the Hill Center (921 Pennsylvania Avenue SE). A big thanks to Jennifer Howard, Nike Opadiran, Ross Parman and Claudia Vilato for volunteering to represent 6B09 as Resident Members on the ANC 6B Hill East Task Force. Their appointments will be voted on by the full commission at the Sept. 10 meeting. I’m still looking for a volunteer to serve as 6B09 representative to the ANC 6B Alcoholic Beverage Control Committee. If you are interested, please contact me. I’m really excited that Curbside Cupcakes is moving into the old Crepes on the Corner space at 257 15th Street SE. Owners Kristi and Sam plan to open in the next month or so and will be offering more than cupcakes. Should be a great addition to 15th Street SE and Hill East! Mark your calendars! I’ll be holding a Neighborhood Town Hall meeting on Thursday, October 10 from 6:30 pm – 8:30 pm at the Chapel at Congressional Cemetery (1801 E Street SE). More information to come! Speaking of Congressional Cemetery, the first Day of the Dog Festival will take place at the Cemetery on Saturday, Sept. 21 from 10 am – 3 pm. The festival is open to the public and will include contests, music and local vendors. This entry was posted on Monday, September 9th, 2013 at 3:38 pm and is filed under 15th Street SE, ANC 6B, Congressional Cemetery, Development, Penn East. You can follow any responses to this entry through the RSS 2.0 feed. You can leave a response, or trackback from your own site.